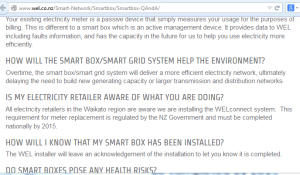 Waikato lines company WEL Networks Ltd. should be ashamed of itself for including a statement on its website that appears to be designed to mislead its customers into believing that it is compulsory to accept the installation of a microwave radiation-emitting “smart meter” that the company has chosen to call a “smart box”. In fact there is no law or regulation that requires any company to install “smart meters” or any person to accept a “smart meter”. 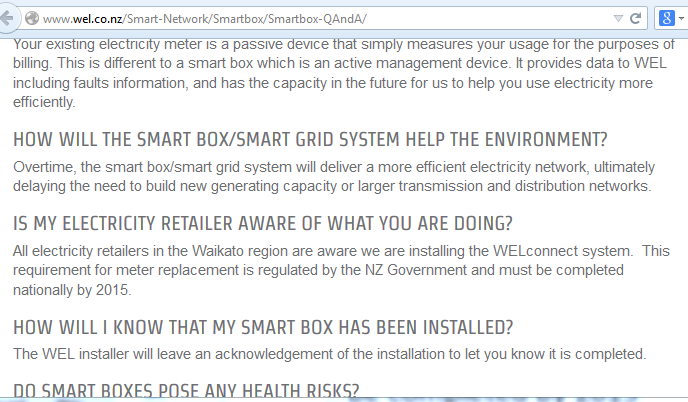 More information on the WEL “smart box” installation programme may be found at the links below the image.